Fergus Mackain's Wartime Sketches: Rare wartime sketch by Mackain discovered! Rare wartime sketch by Mackain discovered! It’s an exciting time for FMSketches as a previously unknown Mackain postcard has been discovered by a collector. 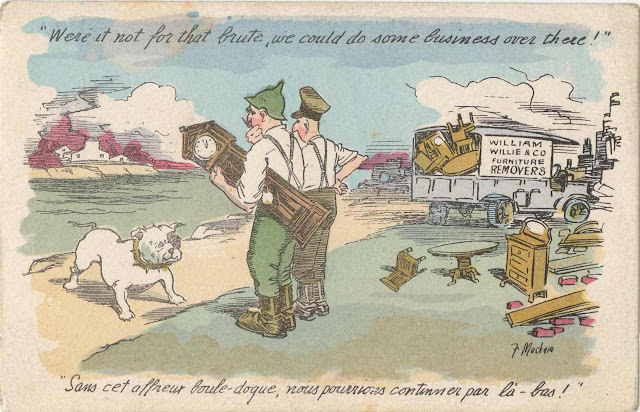 The card, a cartoon of Kaiser Wilhem at the start and end of the war, is similar in style and content to the “Boule-Dogue” propaganda postcard OP2 (catalogued under “Other Postcards”). 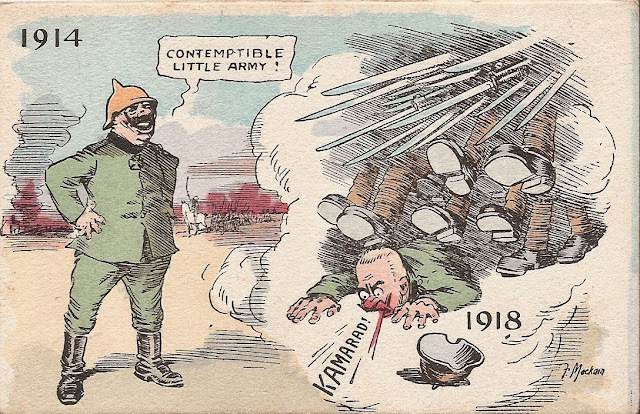 The date on the reverse of the new “Kamarad” postcard – 20-11-17 – is the same as OP2, and both are printed by Gaultier, which may indicate that a series of propaganda cards featuring the Kaiser was created by Mackain. However, in the absence of a numbering sequence, or without other similar cards to compare, we have to assume for now that these are one-off cards. The new card will be added to the online catalog soon. If you have any more information regarding these cards, or if you have another Mackain card similar in style, please let us know by adding a comment to this blog or by sending an email to fmsketches@macbrem.com.